Last time, I talked about how we decided to make our own MDF cabinet doors, and today, I’ll explain how I did it. The first thing was measuring. 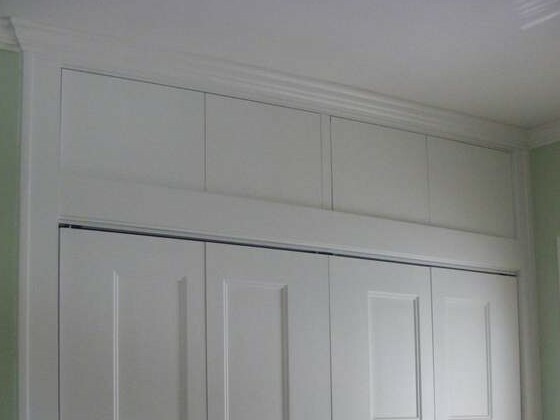 Inset doors need to be carefully measured because there’s less room for error than with an overlapping door. We followed the directions from an online video about determining the size of the door, based on the size of the opening. This method basically entails subtracting three-sixteenths of an inch from the opening measurements. We had two measurement challenges. First, because our openings were not perfectly square, we measured the height of the openings at both ends, and then drew a line for the upper cut at an angle between those two heights, making the top edge un-square. Second, because we were putting four cabinet doors across one open space, we had to put a vertical support in the middle of the opening for the center doors to attach to. We wanted to match up the door sizes with the panels in the bifold doors as much as possible. To do this, we made the middle doors slightly more narrow than the outer doors to offset the vertical support and still line up with the bifold doors. Cutting the doors was quite a slow process, because I had make sure that the MDF on both sides of the cut was well supported, and wouldn’t move once separated. Otherwise, the saw may have gotten trapped, or done some damage to one or both edges. I clamped a straight piece of wood to the work piece to at act as a guide for the buzz saw to follow. If you use this method, it’s best to try moving the saw along the guide prior to cutting to make sure that your cable is long enough, and bits of the saw aren’t going to hit the clamps. 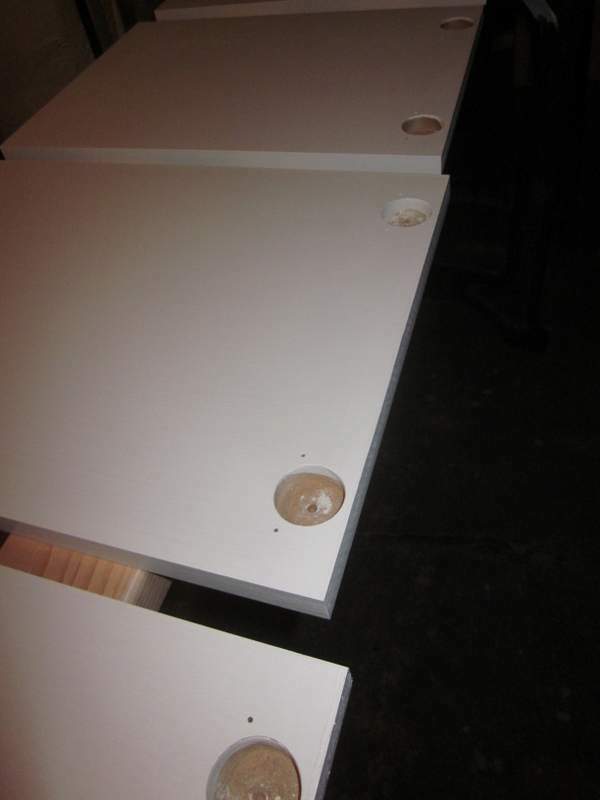 Once all the doors were cut, the holes were marked for the hinges using the template. I was a little concerned that I would go too far with the big hole, and drill all the way through the door, but I found the bit was quite easy to control. The upper closet doors drilled, painted, and hanging out in the basement. Once cut and drilled, the doors were painted. MDF must be quite porous, because the primer paint readily soaked into the doors. The three top coats went on easily enough though. 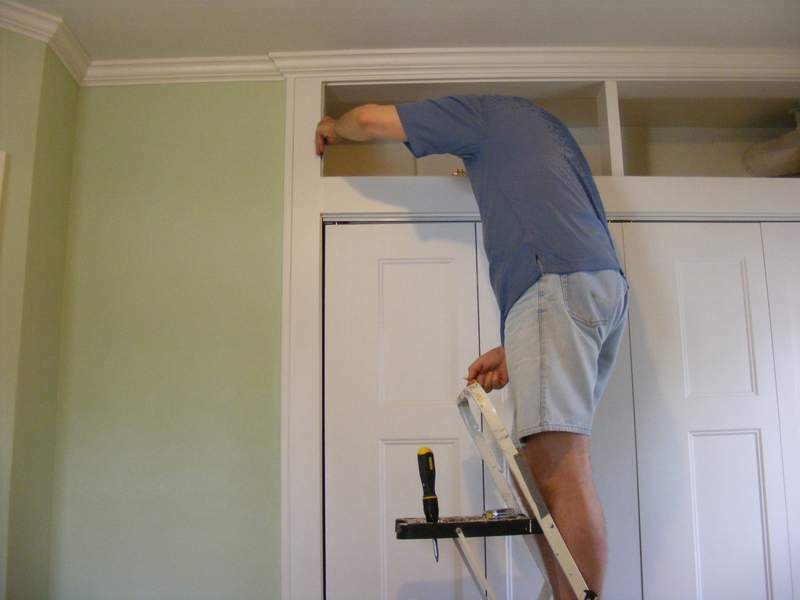 Attaching the European hinges to the upper closet doors is easy. We attached the hinges to the doors. 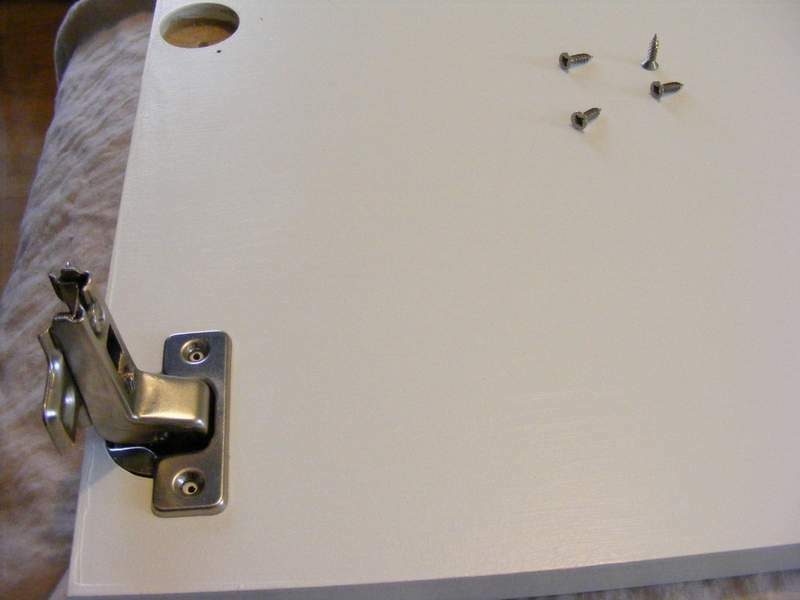 Then, holding the door in place, I marked where the hinges would attach and screwed them into place. Fitting the hinges to the opening. One excellent feature of European hinges is that they are adjustable in all three observable spatial dimensions. So after the doors were hung, it was an easy matter to adjust them to exactly follow the top edge. The upper closet doors in place. There it is. Judge for yourself whether or not we successfully made converging lines appear parallel. So, there you have it. Opinions may differ on whether we managed to disguise the fact that our house is all wonky. Although it does seem a bit odd that, on the one hand I’m trying to disguise this imperfection, and on the other, I’m telling the world about it. Oh, the joys of blogging. 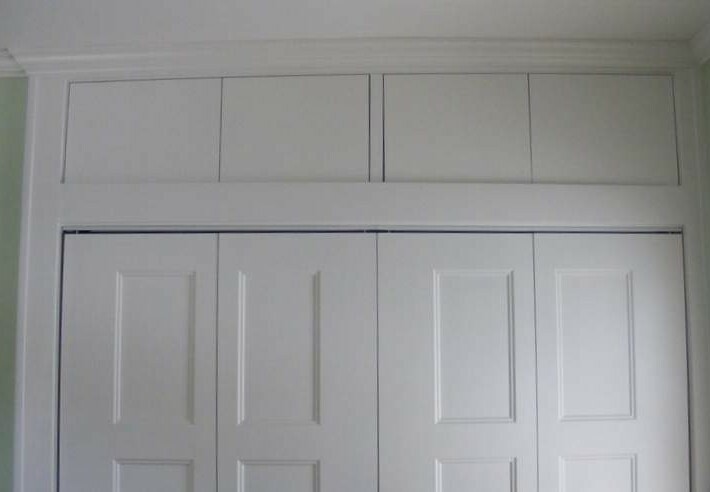 This entry was posted in Construction, Decor, Windows & Doors and tagged DIY cabinet doors, european hinge template, installing european hinge, installing MDF doors. Bookmark the permalink.